Both jails are designed as a Pod style, which allows many inmates to be supervised by few staff. 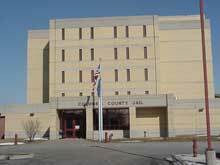 The jail currently employs 33 Jail Deputies, 1 Jail Clerk, 6 Jail Sergeants, 1 Lieutenant, and a Captain. Please check the Frequently Asked Jail Questions for answers to your specific questions. You can also call the jail at 608-742-6476.